Osun State Police Command has arrested sixteen suspected fake election observers in the ongoing governorship election rerun in Osun state. 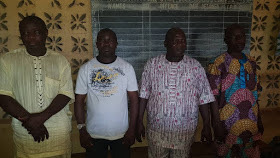 The all-male suspects were caught in custom fit INEC Observer tags, face caps, jackets and PDP membership cards. According to the statement by Police PRO, Folashade Odoro, the suspicious suspects include a PDP House of Representative aspirant in Orolu Federal Constituency, Moshood Adey and other PDP members. The Police reported that some of the accredited INEC Observers were arrested or denied access to polling units.